Did you get a new iPad for the holidays? Congratulations! Still learning how to use this wonderful device? 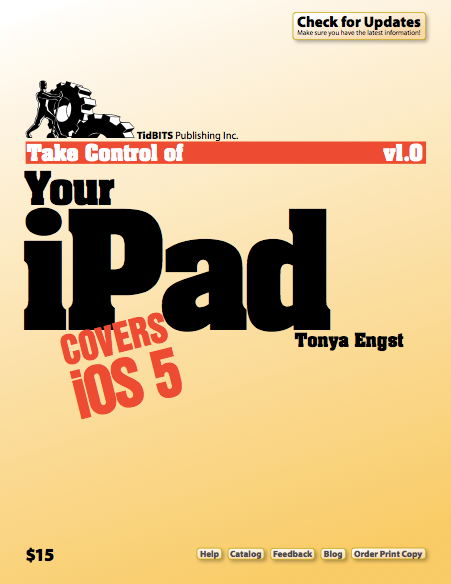 Make it easy on yourself and pick up a copy of Take Control of Your iPad (TCYi) by Tonya Engst. I have a number of Take Control ebooks, and they all have one thing in common: the writers focus on one topic and they do it very well. In TCYi, Engst concisely, yet thoroughly (as well as humorously), explains the ins and outs of using an iPad running iOS5. The book starts with an overview of iOS5, followed by a discussion of which iPad to buy, assuming you’re still in the market for one. Next is the basic and advanced setup of the iPad. I recommend reading to this point from the beginning; the rest of the book can be read straight through or in any order on an as needed basis. TCYi covers everything you can possibly want to know about using an iPad. Want to use the Calendar app but don’t know where to begin? See page 92. Not sure if you can watch videos on an iPad? Page 128 will let you know. Email, iTunes syncing, web browsing, apps, music: if you have a question about these topics, TCYi has it covered. There are plenty of screen shots scattered throughout the book that help explain the text. Tips or items of note are highlighted in yellow boxes to stand out. Blue text is links to other parts of the book, or interesting web sites. If you’re reading on an iPad with iBooks, tapping the bottom of the screen brings up a ribbon of small page icons. Clicking on any of those icons will bring you to other parts of the book. Take Control ebooks are available in different formats, and can be read on many different devices. You’ll need Adobe Reader for Windows or Mac, or Preview for Mac, if your preferred reading method is on the computer. Otherwise download the EPUB version for iPad/iPhone/iPod touch, Sony E-Reader, or Nook. If your reader of choice is the Kindle, there’s a Mobipocket version of Take Control ebooks. More information about which version is right for you, and how to get the ebook onto your device, can be found here. Take Control of Your iPad is a handy reference to help you enjoy using your new iPad/iPad2, or assist you in learning iOS5. However, if you’re an experienced iPad user like I am you probably already know most of the information in this book. I must admit I did learn (finally!) how to swipe between open applications. Check out the Table of Contents on the Take Control web site to see the full list of chapters in the book. If you want to know practically everything you need to know about the iPad, experienced user or not, Take Control of Your iPad is a worthy addition to your library.